2015 Molecular Devices EMax Plus Microplate Reader Protein Quantification ELISA . New Life Scientific, Inc. 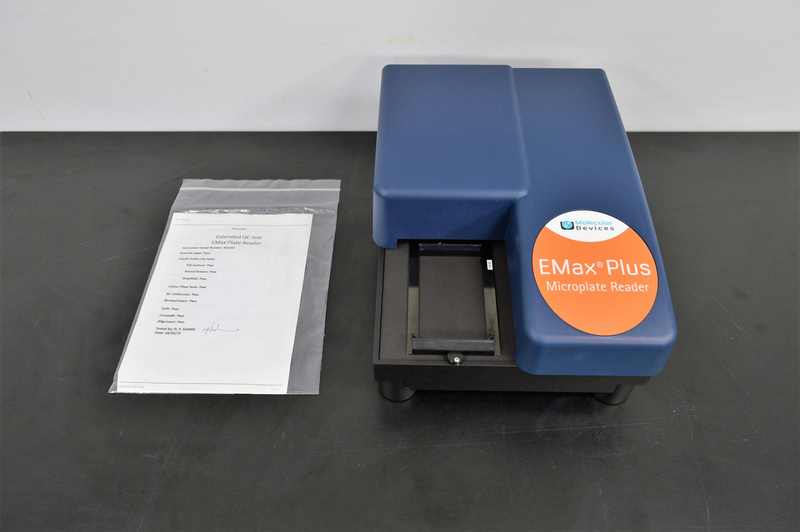 The Molecular Devices EMax Plus microplate reader is capable of performing a number of data analyses such as enzyme and protein quantification and cell viability within flat or round microplates. The reader employs a tungsten halogen lamp at a visible wavelength of 400-750 nm and includes 8-filters in the visible range to perform specific assays. This EMax Plus is in excellent cosmetic and functional condition, without signs of use or aging. This product was manufactured in 2015. There is no on-board lamp and it will need replaced prior to use. New Life Scientific technicians have tested this instrument for functionality and inspected it for excessive dirt or damage. The technicians have confirmed that this product is operational and had no signs of extensive wear or mishandling. Using software (not included) that was preinstalled on a PC workstation (not included), the eMax performed several readings. Unfortunately, the lamp used will not be included. Testing consisted of sampling a microplate that was preloaded with beads and a second microplate containing distilled water and a shop derived sample. The analysis software performed readings on both plates, noting absorbances that were appropriate and consistent with loaded wells.